Posterior Cruciate Ligament (PCL) – the ligament, located in the back of the knee, that controls backward movement of the tibia (shin bone). Similar to cruciate ligament injuries, an injury to the collateral ligament causes the knee to pop and buckle, causing pain and swelling. 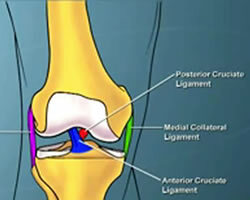 The symptoms of a collateral ligament injury may resemble other conditions or medical problems. Always consult your physician for a diagnosis.